When I surveyed 100 women about their hopes, worries and fears around maternity leave, the results were fascinating. From this, I was able to produce a brilliant handout sharing their Top Tips. You can download your copy here: How to Make The Most of Your Maternity Leave. One of the questions I asked What concerns did you have, if any, before starting your maternity leave? and this graphic below reflects the main concerns of the 100+ women who responded. 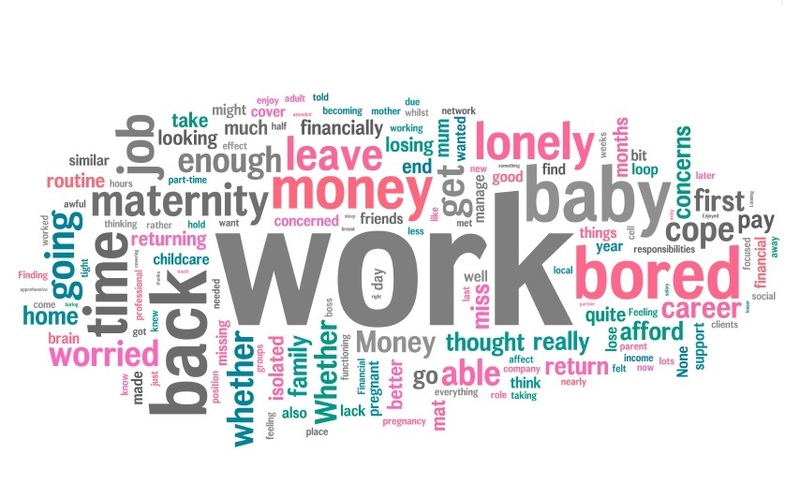 Women worried about going back to work, money, loneliness, boredom, childcare and how would they cope, in all senses. What about you? How does this reflect your concerns about maternity leave? Leave a reply and let me know. When I started maternity leave, my main concern was money. Then we realised that we’d have enough money, so I started to worry about what I was going to do when maternity leave was over. Would I be able to work and look after my daughter at the same time? I worked from home then and still do now, so it was a major concern once the maternity pay ran out. Looking back, there was no need to worry and I don’t think I would going on maternity leave again (whenever/if ever that happens). I’ll look forward to the time I get to spend with my baby, and know the last couple of months is when I can think about what to do with my business coming back, and build up the client base again. Fabulous story, thanks so much for sharing.